Makeover your bathroom with just a single touch!Start with these fun and decorative shower curtains. These unique designs match well with various color palettes of towels, rugs, bathroom mats and any other bathroom accessories. It¡¯s a quick and luxurious way to refresh and completely change the appearance of a bathroom without a big expense. High resolution pictures bring a 3D like realistic experience to your life. You can find a theme for everybody and every interest in our Homenon Amazon Collection. They will be shocked by the superior quality of the item when they open the present. Colors won't fade thanks to new digital printing methods. A bathroom is where you spend a considerable part of your day, it's a place to relax. Enter a new world by having our shower curtains. Can be at the seashore, can feel ocean waves or meditate by the sound of water while staring at mountain landscapes. If you are a fan of sports or have a hobby of any kind, you will be spending time with it in your own personal space. Either a gift to your family or friend, relative or boyfriend girlfriend, or to yourself, the item should be interesting and authentic. 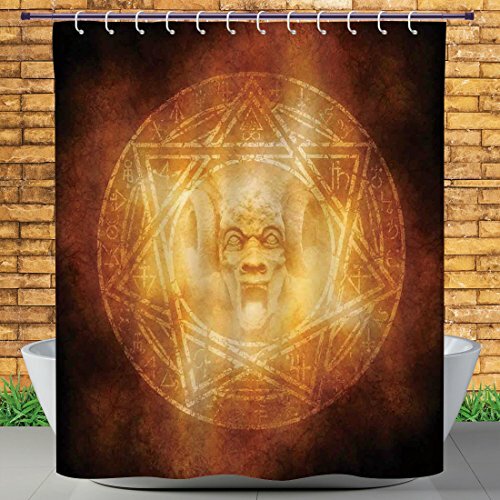 Men, women, kids, teens, boys or girls everybody will love this shower curtain. Any person from any profession will be thrilled by the difference the curtain brings to there house decor. [Homenon Design] This elegant bathroom shower curtains made of 100% Polyester fabric adds extra rust-resistant metal grommets and 12 high-quality plastic hooks Without the ROD, features a classic pattern, which can blend with any existing home decor. [Dimensions] 72"Width By 84"Height.If you need special size, please contact us. [Satisfaction Guarantee] Take Homenon Brand bathroom shower curtains to your home to give your bathroom a vivid look. If you have any problem or suggestion, please kindly contact us, we provide support for you within 24 hours. If you have any questions about this product by Homenon, contact us by completing and submitting the form below. If you are looking for a specif part number, please include it with your message.